Whenever I log onto Campus Research to look for court cases, I notice the quick links on the left to seminal cases in our nation’s judicial history. Right at the top of the alphabetical list of famous documents is the topic of this week’s featured book. 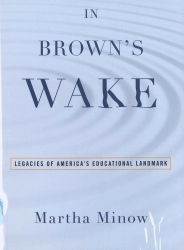 Minow, Dean of the Harvard Law School, takes a look back at the landmark case of Brown v. Board of Education, in which segregation of schools based on race was declared unconstitutional. She examines its impact in the schools over the past fifty-six years, a legacy that has spawned the promotion educational attainment for all students, regardless of race, gender, language or other discriminable characteristic. The author assesses the progress made with the ruling, as well as the future strides that must be taken to ensure a quality educational system for all. The best part: plenty of notes and references for further research – the bibliography takes up a third of the book! This entry was posted in new stuff tuesdays and tagged books, civil rights, education, equality, law, new stuff, race, supreme court. Bookmark the permalink.